Resources / Sports / Great End of Sports Season Party Ideas! It is unfortunate that season-ending parties are usually thrown together at the last minute, often by coaches who don’t have much time. With a little planning ahead by coaches or by parent volunteers, those parties can be much more enjoyable for parents and kids. AND much less stressful. It is not always possible to put a date for the end-of-season party on the calendar at the beginning of the season. There’s just too many variables with playoffs and other calendar changes. However, if you are in charge of the party, you can begin planning other things: trophies, coach’s gifts, other program ideas, and invitations. With SignUpGenius to help, you can actually assign tasks with a well-cushioned deadline so that many of the variables will already be taken care of. Then, as soon as it is possible, choose a date for the actual party, knowing that half the work has already been done. Many teams get stuck in a rut, doing the same party year after year. And quite honestly, it gets to be rather monotonous. Why not change it up every year? Why not make it an event that parents actually look forward to? • Restaurant party. Contact them for group packages and reservations. The old standby is pizza, but you could look for other places with buffets or games. • Ice Cream Social. Who says the end-of-season party has to be a meal? Why not have a dessert party where each person builds his own Sundae? • Dessert Potluck. Everyone brings a favorite dessert. • Potluck at the community center or school cafeteria. Although this is a bit on the predictable side, it is still a viable option. Be sure to incorporate SignUpGenius in this for planning ease. • Outdoor party. Cookouts or potlucks at the park, pool, beach or lake give the kids lots of room to play. • Brunch. Outdoors or in, try celebrating earlier in the day with coffee, orange juice, donuts, bagels, fruit. • Active Parties. Celebrate with a sports activity, such as laser tag, ice skating, or bowling. • Competition Parties. Get everyone involved with a little healthy competition. Parents vs. kids scrimmages, games or relays can be fun and unique. • Zoo Party. Plan a picnic lunch and party to be held at the zoo after enjoying the sights. Many end-of-season parties can feel thrown-together. Because they most likely are. But with a little planning and delegation of duties, the program can actually be fun and creative. • Highlight video. It may take some time and planning, but a video including photos and/or clips set to music is always a winner. • Recognitions. Recognize the coach or each player by passing a ball and taking turns saying what you like about the coach, season, or team. • Certificates. If you decide your team is not a trophy-for-everyone team, then how about certificates made on the computer for each child? Give each child a fun nickname related to their performance in the season. It’s a great way to make kids feel special. • Coach’s gifts. You may not like him or agree with his philosophy, but he deserves your gratitude for giving up his time and energy to coach your child. Ideas range all the way from restaurant gift cards to momentos, like signed balls or signed team pictures. Take the time to have the kids all write something to the coach on a card. Those kinds of affirmations are far more meaningful than a gift-wrapped package. • Team photos. This is a good time to pass out the team photos taken earlier in the season. Not only does it alleviate the issue of tracking people down later but it can be fun to share and compare. • Guest speaker. Consider a short talk by a mental toughness trainer or someone who has tips helpful for an athlete. This may be more helpful for older athletes. • Parent tips. How about a short session on apps for sports parents to use? There are many options out there, from video sharing apps to scoring apps that might make their sports parenting more fun and less stressful. With a little pre-planning, your child’s end-of-season team party can be more than just an afterthought, it can be a real celebration that both parents and kids enjoy. 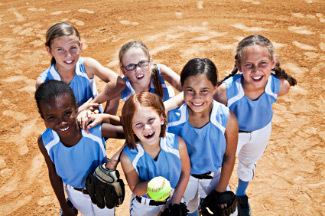 Janis Meredith writes Jbmthinks, a blog on sports parenting and youth sports. After being a coach's wife for 27 years and a sports parent for 17, she sees issues from both sides of the bench. For coaches gifts last year I took action shots of the our little sluggers 4-6 year olds playing t-ball and had them autograph their own picture and then put them into a large frame making it into a big collage. And I slid a little gift card to the movies as well. Even though all our kids get trophies I wanted to give them something a little extra and made each one a photo album of all the action shots that had been taken through the season and had each coach write a letter to each player to put on the back of the album. I still hear about how much the kids love them and look at them all the time. 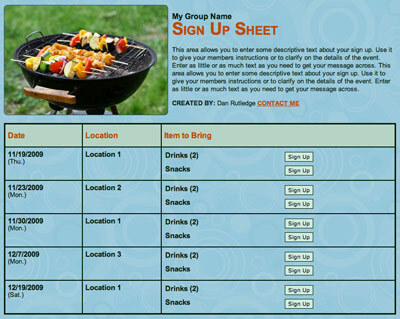 Plan Your Team Party With SignUpGenius!